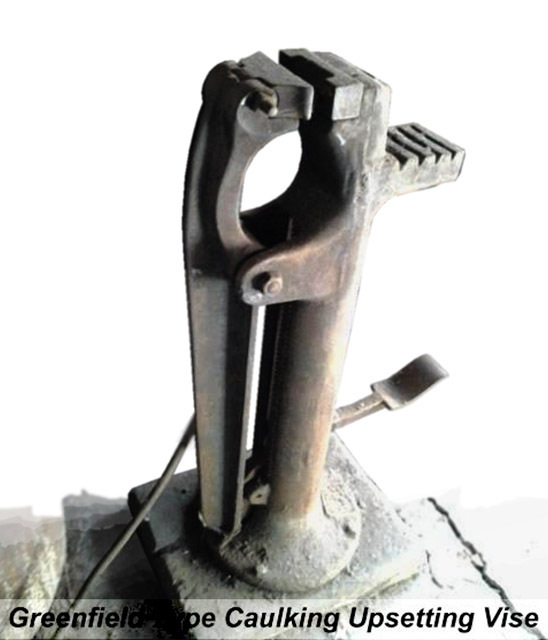 While many people consider these a farrier's vise they are in fact a specialized blacksmiths vise used to make various types of hardware as well as horseshoes. The most sophisticated function, upsetting, is often missing the parts to do so. These vices came with replacable jaws including plain, and jaws for gripping rounds (usually two sizes in each). The inside of the column has teeth that a "bucking block" engaged in and was clamped to the column via a bolt in the slot in the leg. 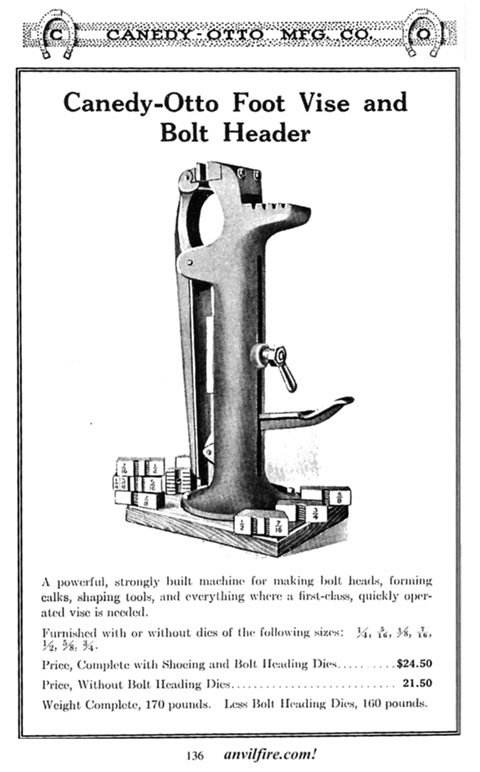 This adjustable block supported the end of a bar beening upset in the gripping jaws at the top. Because they are removable they are usually missing along with spare jaws. New England of the mid 1800's was the scene of almost daily business startups. Anyone with a good idea and some skill could find investors to start a manufacturing company. 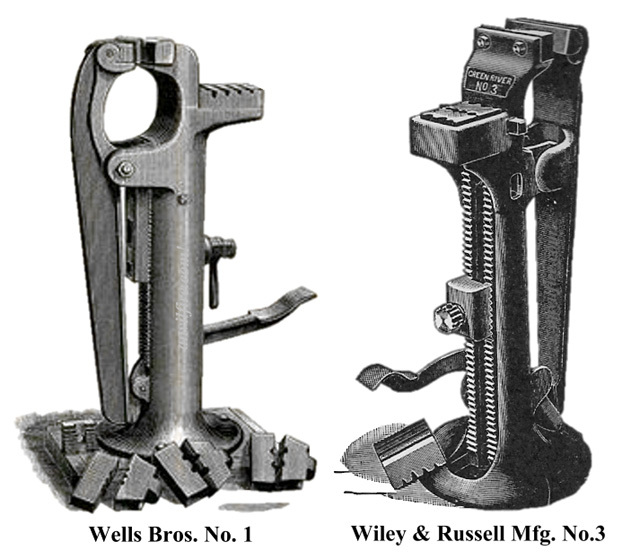 Thus we have the Wells Bros. who left Wiley and Russell and started their own business also in Greenfield Massachusetts. For many years the two companies made similar lines of tools and then were both bought out by Greenfield Tap and Die which is now a small bit of Kenametal (a cutter bit manufacturer). Vise Making Vise This screwless foot operated vise is the perfect upsetting tool for screw vise handles. 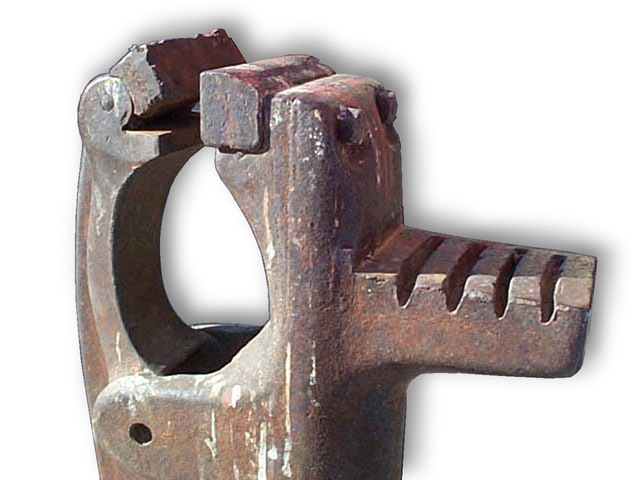 The large "eye" under the jaws is more than large enough for the largest Vise screw ball end the height of the vise is plenty to upset all but the longest vise handles. Above you can see how the movable jaw also tilts so that it maintains a tight parallel grip on the work. You can also see where the vise has been used for arc welding and weld material stuck on the jaws (abuse). I bought one of these many years ago from Bill Gichner. It had a shiney black finish and looked to be in good condition but turned out it was missing the coil spring that opens the jaws, the bucking block and extra dies. The dies in it were 1/2 and 5/8 round (I think) with a 1/4" square V-groove hand cut between the rounds. Bill and another smith had cut the square groove for nail or spike making. I sold it to another dealer who sold it in Pennsylvania. These vises often sell for premium prices but just as often are missing parts. The dies are complicated cast shapes that are not easy to reproduce and vary from vise to vise. I would love to have another one of these in my shop if it was complete. I suspect I would be more likely to build one for upsetting rather than pay a premium price for a tool that you cannot get replacement or optional dies. Epic View with dies from 1/4" to 7/8" and short bucking block. The above is obviously a Wells sold by Canedy Otto. Note the wooden block it is mounted on. The wood block shows in the illusatrations and the top photo. This was probably part of the crating and was convienient to keep the vise mounted on it.